The weather outside has been shocking, Need I say more? Opportunities to get out under clear skies have been quite slim really. There have been chances so far this year, but to be honest, by the time I've got home from work, it's not really been on top of the list of things to do. Hopefully, the chore of setting up will be greatly reduced soon when I get around to finishing the new pier in the back garden. More on that on the DIY page. Anyway, in the last week, a new discovery has graced our skies in the form of a supernova, designated SN2014J. Located in M82 (NGC 3034), aka, The Cigar galaxy, it was discovered by Steve Fossey from UCL. See the Wikipedia page here. 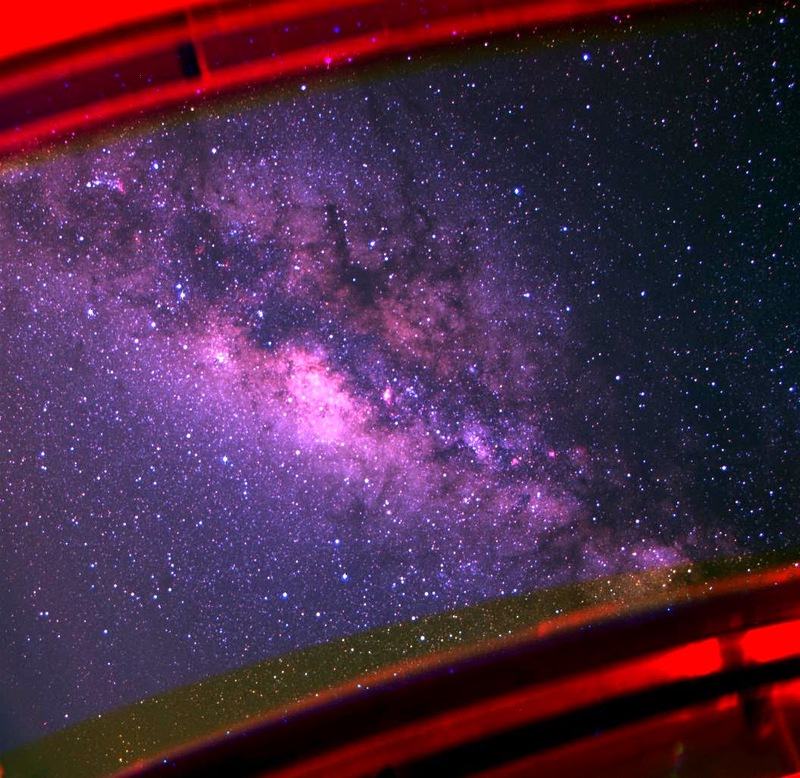 There has been a lot of buzz from within the amateur astronomy community due to the fact that it has brightened readily over the last week becoming an object visible to many amateurs. So, tonight I thought I would give it a go. M81 and M82 are two galaxies in the same FOV through the 18mm eyepiece I have. They are separated by approximately 1 degree - or one inner circle in a Telrad finder. With cloud cover beginning to role in from the West, I set about lining up the Telrad and took the opportunity to view Jupiter and then off galaxy hunting. Locating the pair of galaxies was fairly straight forward and quite pleasing given that I hadn't observed them before. Yes, the crappy weather really has lasted this long! On the news front, the UHC filter has arrived and an order placed with FLO for an LP filter and Lunar filter. In this most recent of sessions, I've been able to get first light with the UHC filter. Also, the pier is now complete and the mount fits nicely onto the steel plate. See the DIY page. The two targets were the Orion Nebula and Jupiter. In less than ideal conditions when seeing wasn't brilliant and every neighbor decided to switch on their insecurity lights, I managed to get half an hour of play time with the filter. Unfortunately not much to report on it due to the conditions. However, on the 8th March, I had a better chance to get out with the scope in slightly better conditions, only to be slightly annoyed by the ever brightening moon. However, it was an evening for a longer look at Jupiter. The UHC filter though putting a green hue on the planet did darken it slightly and allowed me to pick ou more detail than I was able to do without the filter. Other targets for the evening were M40, a double star in Ursa Major, and M103 which is a cluster in Cassiopeia. All in all, nice to be out, but in need of a clear moonless night! The first clear night for a long while. Aided by the fact that the moon, though still bright, rose quite late at night or into the early hours, which meant the sky was quite dark. Seeing was not bad, certainly the best it has been for a while. So, it was a good chance to make it a night of firsts. Since the last observing session, I have taken delivery of a Moon filter and an LP filter. The first objective for the night for me was to test out the new filters. So, with Jupiter in my sights using the 8mm EP, I compared the image with and without the moon filter. I was hoping that it would help dim down the image slightly as Jupiter is quit bright at the moment which makes making out some of the detail hard. The filter did help, although seeing was brilliant at that point so I didn't send too much time looking on this occasion. The second objective was to test the LP filter out. I have read numerous threads saying how the LP filter can help in some cases and makes no difference in others. I chose the Orion nebula to look at given that it was easy to find and familiar. Whilst the image was changed slightly, I couldn't categorically say that the quality of the image was any better. However, this was with a view looking away from the lights of town. Onto some of the next objectives. It was to be a night of more firsts, with new ticks and new areas of the sky to observe. I spent time looking at Auriga, Cancer, and Leo to name but a few areas. Please see the obs table for the list of all the objects observed. But, perhaps the highlight was M37 and M38. Both clusters, and I was able to make out the 'X' in the cluster of M38 quite easily. An excellent night in the back garden using the pier I have put together over the course of the winter. I spent a total of around 2 hours or so at the EP. I could have spent longer, but Sunday nights have to be sensible with work the next morning. And, to round things off, a cheeky selfie at the end of the night before wiping off the frost from the OTA and packing up for the night! Yep, that's right, July! So a reasonable amount of time has passed since the last observing session. As I have mentioned to a fellow observer recently, more 'Arm Chair' than 'Out There' of late. But, now the solstice has been and gone, nights are starting to get darker. This is perhaps my most favorite time of the year, with Cygnus and Lyra boldly showing themselves overhead, the Milky Way sweeping across the sky with Andromeda and Cassiopeia in good positions for viewing, it gives plenty to go at from the back garden. The weather has been hot and sitcky for the last few weeks, with one period of sever thunderstorms over a couple of days crawling across the country. Observing opportunities have been reasonably plentiful, but timings and the requirements for late nights have made things a bit tricky. But, life is too short, and when you want to go, you've got to go. So, last night 24th July, I set up about an hour before sunset to make sure all was ready. 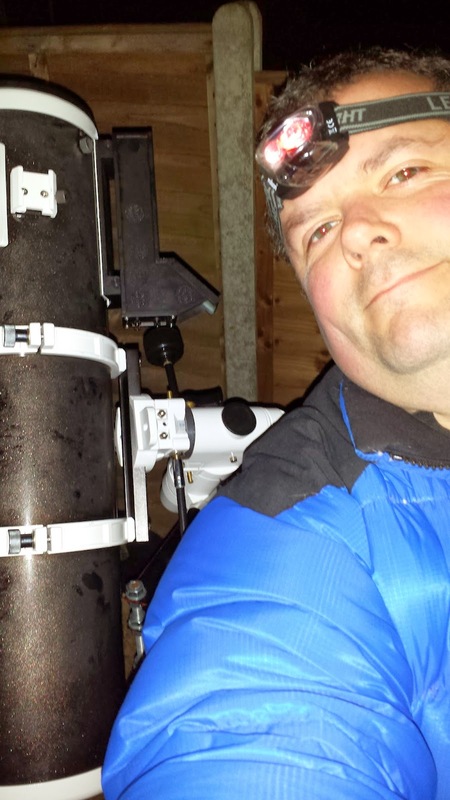 The air temperature at night has been in the mid to high teens, so comfortable to be able to observe in short sleeves, and less cooling required on the scope. however, seeing is being effected and distorted slightly. Now, I could have gone for an all out tickfest tonight, but I visited two targets, M56 and M57, spending a good amount of time on each. 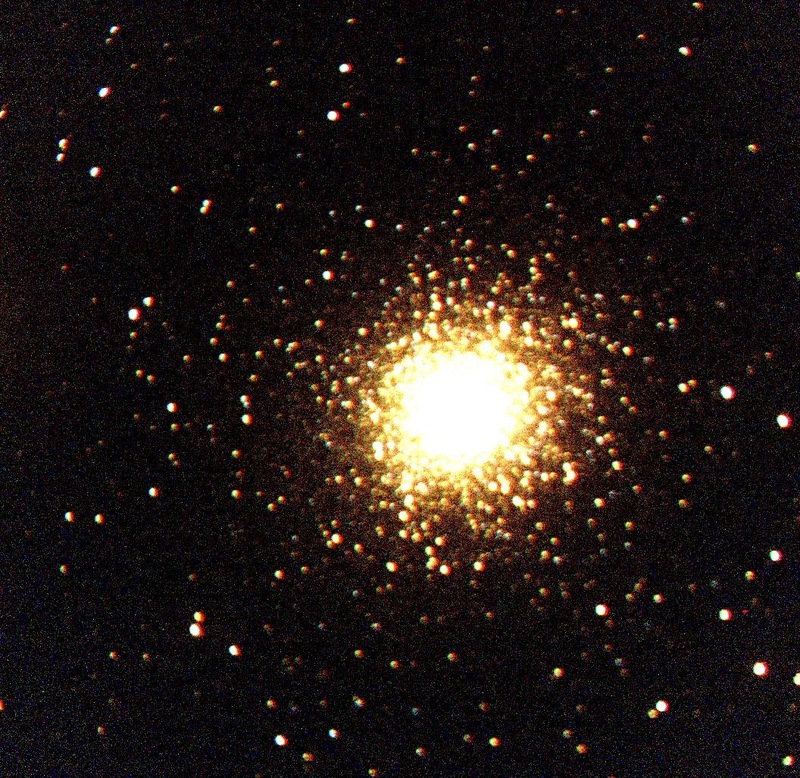 M56 is a globular cluster in Lyra. It's magnitude is given as +8.3 which I must admit, I found a little bit of a struggle to resolve with my 150mm reflector. However, find it I did. For me, not much more than a small white smudge on this occasion. I viewed it with my 25mm BST Starguider. I couldn't make out any individual stars to speak of, but I must have to put that down to average seeing conditions. Nevertheless, I then moved onto a favorite at this time of year, M57, the ring Nebula. Again, found in the proximity of the constellation Lyra. A similar magnitude the M56, M57 is +8.8 planetary nebula. Using the 25mm BST EP, I was able to make out the clear boundaries of the nebula in visible light. Still a small, but obvious target. When I moved down through the EPs, I finished at a 5mm BST EP. Using this, I was pleasantly surprised at what I could resolve. Overall, the nebula was dimmer as you might expect, but, though appearing as a monochrome image, after about 15 minutes at the EP, I was able to make out clearly the boundary ring which give its name to the nebular, and then the darker regions of nebulosity within it. However, the 15th Mag star in the centre of it is way beyond the capabilities of my current scope. witht he phone going for a late night call from the Mrs, and cloud beginning to drift around the sky, I decided to call it a night about 12.45. It was a bit of a wrench to come in, especially as the forecast was for it to clear up totally a bit later on, but, decamp from the back garden I did, happy at what had been seen. Remote Imaging - A shot in the dark. In this months The Sky At Night magazine, I cam across a really nice article and a free offer for a trial session on a remote imaging set up. The article gives a link to http://telescope.org and give a brief description of what is available. In brief, the collection of telescopes is called the Bradford Robotic Telescope and is housed in an observatory on Mount Teide in Tenerife. This is an observatory maintained an run by the University of Bradford. It's main purpose is for educational purposes to schools and the university itself, but it is also available for use to the general public. I've had my eye on some astro-photography equipment for a while, but because of the expense, I just haven't take the plunge. So, when a free opportunity at remote imaging presents itself, it just has to be taken. The trial offer gives a limited selection of 6 objects that you can target. Also,a s it's a trial, you also have to go with the default photography settings in term of exposure, iso, magnification etc. Nevertheless, once the image is taken, you can then use their online tools to process that image. I am lead to believe that if you start a subscription to the service, these options can then be customised, and the option to download the data to your local machine processing can also be taken. Unlike other remote services, where you book a block of time, and have to connect, and be online for the duration, this service allows you to submit your peramters to a queue. Then over the coming evenings, the queue is serviced and when your job is completed, you get an email and your image is left in your web portal. I chose the Globular Cluster in Hercules, the Lunar Surface, the Dumbbell Nebula, the Andromeda Galaxy and finally the Milky Way. Whilst the first wave of images were OK, I thought the Lunar Surface photo was average and out of focus, so I have omitted it. 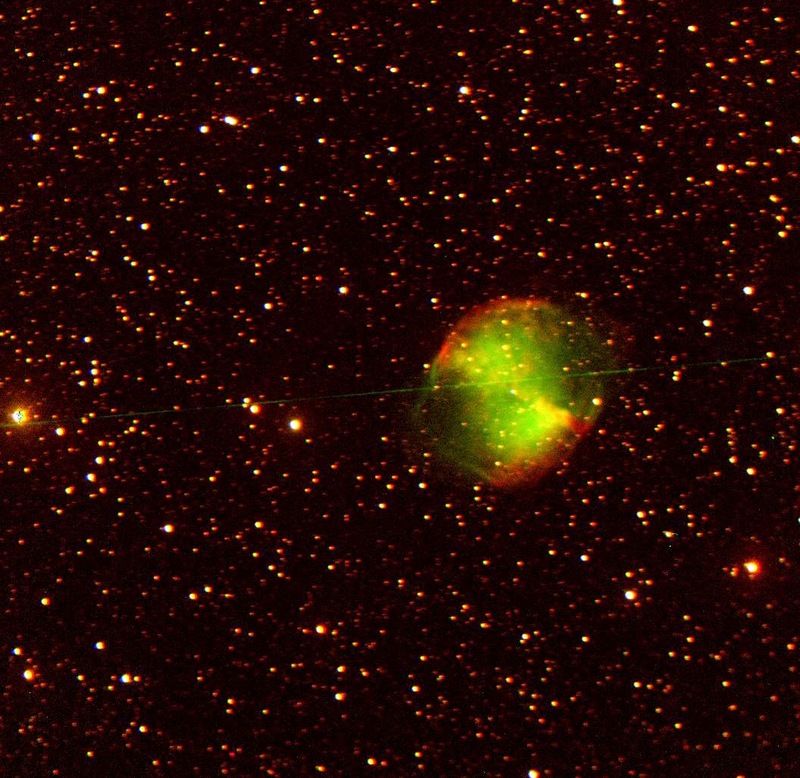 The attempt at the Dumbbell Nebula was OK, but the motorised scope must have been misaligned as only half the nebula was visible. So, I re-submitted the job to get that shot re-taken. These are the final images. M13 Globular Cluster in Hercules. Though undeniably, there are many stars resolved in this image, there are slight problems with focus or perhaps colimation of the source telescope. Nevertheless, the very bright and condensed nature of the cluster does leap out from the image. 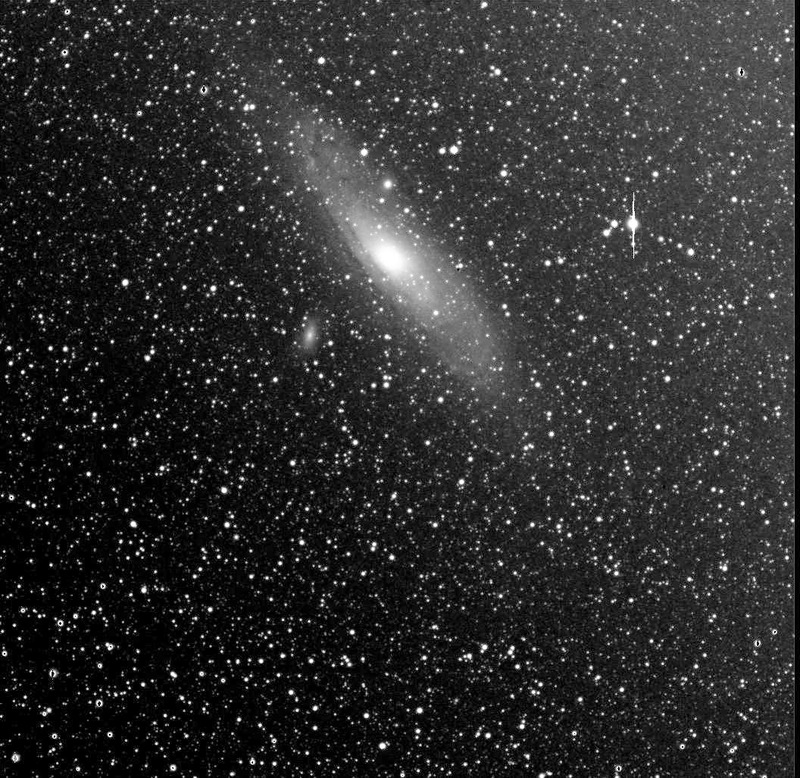 M31 The Andromeda Galaxy in Andromeda. This is perhaps the image I am most proud of/ The Andromeda Galaxy, in the right conditions is a naked eye object with a magnitude of +3.4. This was taken using a black and white camera, which why, in this instance there is no colour resolved in the image. The central core of the galaxy has somewhat washed out some of the central detail, but that is to the advantage of additional detail coming out post processing of the outer regions of the galaxy. Two other objects that have been captured are M110 which is the fainter smaller galaxy left of Andromeda, and the bright star vAnd -35 And with it's partners (if I can use this term to describe them) HIP 3817 and HIP 3840. This picture is not orientated in the same way as features in many texts, usually featuring rotated 90 degrees clockwise. Processing this image has allowed me to pick out more features, dust lanes and stars in the image than what was initially presented. This is a planetary nebula in the constellation of Vulpecula. As with many nebulas, the raw image quires a certain amount of processing to bring out the colours of the nebula gasses to visible light. The shape of the dumbbell can be clearly seen in this image, with the red areas representing each end of the dumbbell shape. There are quite few stars resolved in the centre of the nebular, although which of these exist within the nebula, and what is being seen through the nebula, I do not know. Second July Night On The Bounce. So, for the second night in a row, with no commitment to having to be up early in the morning, approaching a new moon, and with clear skies, it was another good change to get out and have a peak. The previous night had been all about concentrating on a handful of objects, so tonight, it was time to widen the horizons. So, first for the mini tick-fest was Andromeda. I first saw Andromeda last year and remember being a bit gobsmacked on how I had failed to find this huge object on so many occasions. So, as if to prove to myself that the first wasn't a fluke, I dug out the Telrad charts and quickly tracked it down. Conditions for the night were mild, clear with reasonable seeing to good seeing directly above. Due to the positioning of Andromeda, when I located it, it's appearance was somewhat washed out slightly due to the atmosphere and its position in the sky. Nevertheless, I was pleased that I had located on it, but to be honest, I didn't spend much time on it after that. So, on I went. Next on the list was M52, an open cluster in Cassiopeia. This cluster was quite spread out, and difficult to judge the full extent of. Seeing was improving as the night went on, but as this was an early object, certainly think it would benefit from another visit in better conditions. And so, I moved along to spend some time on my favorite summer region of the sky, Cygnus. M29 is an open cluster in Cygnus which I observed at x30 and x93.75 magnifications. As the target was directly overhead, there was less atmosphere to look through, so the image was much clearer. Initially, I found it tricky to verify that the cluster I was looking at was the correct object, but I verified using Stellarium. At higher magnification, the cluster stood out well against the black sky. M40 was my first object that is also cataloged in the WNC catalog as WNC4. It's a double star in Ursa Major. The stars are small, and at a magnitude of +8.4, they prove a good challenge on my 150mm reflector. The double stars were much easier to appreciate when using averted vision. And so to some of the more popular targets. M57, The Ring Nebula is a popular summer object. It took some finding at first, but with higher magnification, I could make out the main ring of the nebula with an area of darker nebulosity in its central regions. I also observed this object using a UHC filter which turned the background sky into pitch black. Although the nebula was also slightly dimmer, the contrast between it and the background was much better and so made up for it. It was time to spend time looking around Hercules, another popular region of the summer sky. M13 is the Hercules Globular Cluster. When first observed, it appeared as a distinct grey smudge in the centre of the 2 degree FOV. However, the more time I spent at the EP, the more pin pricks of light from individual stars I was able to make out from the object. This was helpde when I changed to the 18mm EP. The centre of the cluster was slightly dimmer, which helped me make out further individual stars. The second globular cluster in Hercules is M92. It's often missed out because it's smaller and often thought not to be as good as target as M13. For me though, it means that it was more important to track it down. I observed a very bright and condensed central core to the cluster. However, because it was so condensed, I wasn't able to define any individual stars. Nevertheless, definitely worth locating and the observation time. And so, to the final target of the night. M27 is the famous Dumbbell Nebula. A planetary nebula that I have had some success with imaging. At first, the nebula appears to be a full circle of nebulosity and reasonably bright. The UHC filter was once again put to use and put it's contrasting properties into good effect with the 25mm BST EP. However, I then changed to the 8mm EP without a filter. The interesting effect here was the small EP itself helped bring out more structure to the nebula. This allowed me to define the accepted image of a dumbbell within the nebula. Now fellow members of the observing world, you will know the normal protocol for taking delivery of any new astronomy kit instantly attracts many nights if not weeks of rain and cloudy weather. However, this time, Jim seems to have called in a few favours and sorted out some good clear skies for himself to get first light on the first night! Follow his blog to read more on what he thinks! Anyway, I digress. I too have had some observing time, but unfortunately, on a school night, so with half an eye on the time, and the intent of being done and packed away for midnight, I wanted to find a new target that I could spend some worth while time on. So, knowing the constellation of Sagitta was high up in the sky, I decided to target M71. The object grabbed my interest because of its decription. Where once it was deemed to be an open cluster, in more recent times, it had been thought of as a globular cluster. The Mag 8.3 object is just on the limit of my scope under the current seeing conditions, so I was prepared to put int he effort to find it. I located it using the Telrad charts and finder. Thanks to these, locating it was quite easy. Initially, I thought it very faint and hard to distinguish against the background of the less than ideal sky.After a short time though, I picked out 3 stars that formed a triangle around the usual light grey smudge. Slightly to the side of centre of the triangle, I could make out the central regions of the cluster. Initially, I observed at x 41 magnification. I then changed to x 93. This had the expected effect of making the image dimmer, but I was able to fill the FOV better. I spent a reasonable amount of time looking around the object before I then went back to the original 18mm EP. Now, back with this EP, I was then able to started to pick out 6 - 8 other stars in the central regions of the cluster whilst using averted vision. Finally, before I wrapped up, something I decided to have a go at an object not listed in the NGC catalog from what I could tell. It's called 'The Fairy Ring'. A series of double stars create a ring shape. I think I might have located this, but I couldn't verify it. Certainly one to come back to! New Scope and first light. For me, first light on the new scope was all about setting it up, deciding on how things needed to be done etc. A whole new learning experience. I got out, and set up the scope. Roughly polar aligned, but I just wanted to get observing, so out with the tripod, on with the counterweights, quick check of the leg with N on it and off to get the tube. It was then I noticed the clouds beginning to mass from the direction of the Black Mountains. That gave me about 45 minutes with the light winds. Aarrrrgggghhhh – what was I going to go for? I was skimming through the skies hoping to find Orions belt. I had seen it briefly before, but with the naked eye so hoped that I could pick out one of the Messiers. I quickly fumbled through the pages of Turn Left and in the excitement of just wanting to see something – anything, ditched it and just used the finder scope to line up on one of the brightest things in the sky at the moment, thinking that I could worry about what I was looking at once I was up and running. Slowly playing with the focuser, the object came into view which is when I realised I had just happened to pick on Jupiter. I wasn’t sure what to expect, but did recall that a thread on here mentioned that it would appear about the size of a pea. I was amazed, and so pleased that I found something, for me, worthwhile. It was so much clearer than I thought it would be. I tracked it, and could make out the 4 moons, all roughly equidistant from each other. Two to one side of the planet, and two to the other side. I was chuffed to pieces that I could make out some of the stripes on the planet. My second outing for all the new toys took place only a couple of days later. Now, being a bit more familiar with how things needed to be set up and aligned, I had a bit more time to think about what I needed to look for. The observing report follows in extract from my post on the Stargazers Lounge forum. I've just come back in from a couple of hours observing out the garden. I'm still getting used to everything including my scope and star-hoping as it's only my third time out, but my plan is to just add two or three things to my list each session. This session though has proven to be slightly frustrating. Skies were looking promising and clear so off I went to set up, but the evening has been plagued by bouts of mist and the neighbour switching their kitchen light on, only to walk back out of the kitchen and no return for another hour! Anyway, I digress and I expect its an issue experienced up and down the country every night! So, first thing to do tonight was to re-align my finderscope. I'd managed to knock it in its holder whilst putting it away in my case after the last session. So, I picked on Alnilam and went from there, eventually getting everything lined up again. Que first wave of mist rolling in! I could see breaks around, so I turned my attention to my copy of Turn Left and the laptop with Stellarium running. It also give the scope more time to cool down. Tonight, I had an idea of what I wanted to do, and that was to pick up from where I left off before. It included a re-visit to Jupiter and M45, The Pleiades and then my first Nebula. I spent a bit of time deciding what to go for, and once the mist cleared, I was off. I'd heard a lot of people mention the The Orion nebula, and in fact, one of my other posts, a forum member suggested it would be a good place to go to next. So, I got my way over to Orion which was now high enough above the roof of my house to see and navigated to it. My first impressions - I loved it. Outside on my own, and still caught myself talking out loud, 'Oh wow, cool!' The small stars were very visible surrounded by bluish hue in the middle of my FOV. I changed the EP to a 10mm which I found slightly trickier to maintain a good view so switched back to the 25mm. Happy and pleased with that, I noticed mist coming back in, but Jupiter was still visible. Already I don't think I could tire of seeing Jupiter, so I returned there once more and picked out its moons quite nicely. Back to the laptop to start looking for a new target. I wanted to find something else in the area of sky I was in, so I returned to Orion and looking through Turn Left, though I would give Sigma Orionis a go. I figured it should be easy to locate the area it was in, but will prove more of a challenge to get into view. In between the odd wave of mist, I homed in on it just when the sky cleared up really nicely. At first I wasn't entirely sure I had it and I was continually referring back to the lappy and book, But eventually I was satisfied that I was on the button, and swapped the EP over to the 10mm. It took some getting used to, but bringing the view into focus, the stars I had in front of me I found were in the same arrangement as I saw in the book, so I was pleased with the positive ID on them. I later found out that when I saw Jupiter, what I thought was a mistake, and a 5th moon was actually HIP 20417 in conjuncture with the planet and its 4 Galilean moons. The only new object of the evening was M35, an open cluster. Using TLAO as the guide for the evening once again, I set up on the back garden to have a bot of a look about. First time observations to Castor in Gemini, splitting stars A and B but I could not pick out C. Also, at low power, the open cluster M67. This was a trip to a friends house who lives within the Forest of Dean and out of the way of any light pollution. I spent the evening doing collimation initially, and then finding some of the more familiar target to show what the scope was displaying. In a dark sky, some new objects came into view as I was looking at a different aspect of the sky, not having our house in the way! The new objects on a very cold a frosty evening were a trio of open clusters M41, M50 and M38. With a spare night to myself, I loaded the car up and picked the dog up after work and headed out into the countryside near the river. Tonight was a night for looking about, seeing what was new, but mostly to try out my new BST Starguider EPs. I also took my camera to have a play. These are two extracts from my Facebook posts I made the following evening. Tonight, I've tried to make the most of the dark clear sky before the moon rises and before the mist started to come in. I mounted the camera on the telescope mount and pointed towards Jupiter, Aldebaran and Orions bow. I didn't check fully but caught the end of the scope in the photo. The light streak at the bottom of the photo is a meteor that crossed in front of the field of view whilst I was taking the photo. Happy days! In the photo, you can see some of the stars in the area of the Orion Nebula (M42), the three stars which make up Orions Belt both in the bottom left of frame. Jupiter is the brightest object near centre of frame and the small cluster of start between Jupiter and the end of the scope is the open cluster of Pleiades (M45). ... last night I was in a field full of weirdy beardie type people winking each other. Enough of that. Also went stargazing with members of the SGL forum. Had a cracking evening and met some good people. A Chap called AlanR, a woman called Ray and of course Psychobilly. Mmm, reading that back it is a bit strange I suppose. Anyway, try as I might, I didn't see the comet but a few people ...got photos of it. Anyhow, first outing for the new barlow and the even newer Telrad (think gunsight for telescopes!) and I checked off 5 new things. M103, a globular cluster in Cassiopeia, M1, the Crab Nebula, M78 a Diffuse Nebula in Orion, M101 The Pinwheel Galaxy which is a Spiral Galaxy in Ursa Major, and finally M51 The Whirlpool Galaxy another Spiral Galaxy also in Ursa Major. Happy days. Got home at 2am with everything covered in ice, but fortunately a day off work today and tomorrow! Seems a long time since the SGL star party. The weather gods have been unkind and the scope hasn't budged since the morning after my visit to SGL8. I've even taken delivery of a new 8mm BST StarGuider EP which still hasn't had its first light yet. 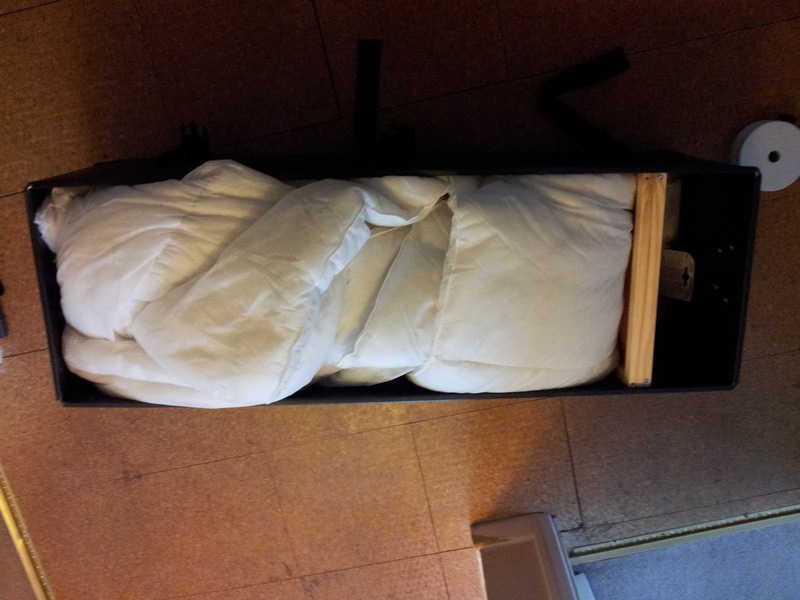 Since my scope turned up, it's been kept in its own cardboard box, kept laying on the spare bed or even transported to SGL8 in a wrapped in a fleece blanket in 85 litre rucksack. Time for something a bit more robust. After searching a bit, I found this company. It's called Trifibre and they specialise in plastics. I looked at their drum kit cases and went with this one. I actually ordered this version, but they sent me a wheeled one at no extra cost. 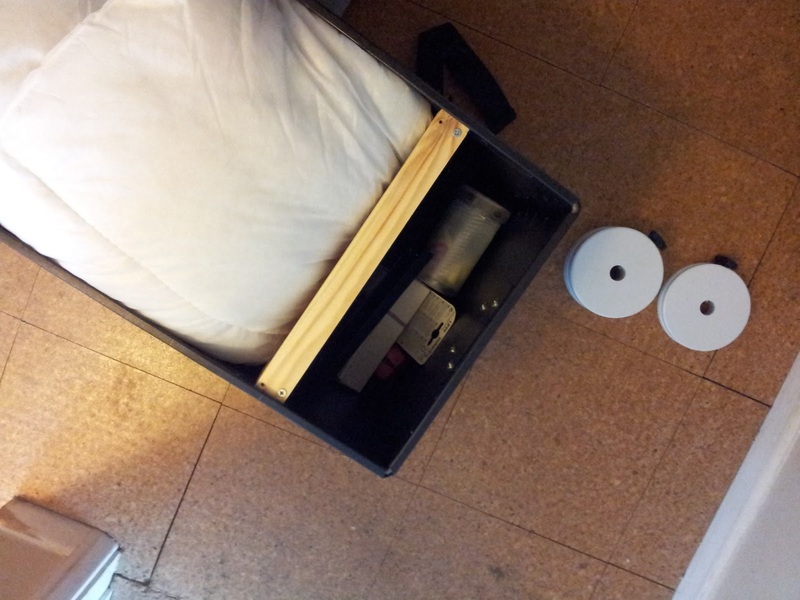 It comes with a thin plywood base layered with a thin covering of foam. 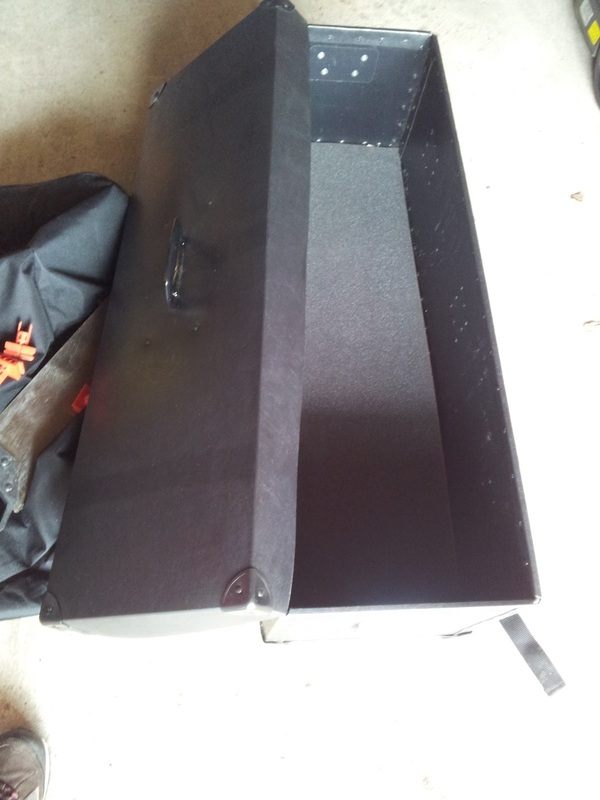 I measured out the length of the case and found that there was enough room for a small partition to be put at one end. In this partition, I could store a small tool kit, the small tray off the mount, collimator and various other odds and ends. I made the partition from some offcuts of wood and 1/4" plywood I had kicking about in the garage. With the partition in place and an investment in a cheap single duvet from Morrisons, it was time to put the scope to bed. And finally, a couple more with the scope all 'cwtched' up with the partition visible and fully utilised. I did decide though that it would be a bad idea to store the mounts counter-weights in the partition. Whilst I think it is strong enough to cope, I don't want to run the risk of them breaking the partition and smashing into the scope. The first clear skies in what seems like a long time gave the chance of a session from the back garden. Frustratingly, it seemed like everyone in the neighbourhood wanted to have all their lights on and their curtains open. Thanks to everyone, I didn't need my red torch to read the star charts. So, the only thing to report was a first tick in the box for M40. Surprisingly managed to pick out the double star at about +8.5 magnitude with the help of the Telrad. It was also first light for my BST StarGuider 8mm EP but didn't do it justice with the cold and the issue with neighbouring lights. Hopefully, second light will be much better. Had a quick session in a POC backyard obsy which worked better than expected. Saw a couple of targets including M51 and M40 but nothing new for the tick list. Next time the makeshift obsy is put together, I'll get a photo, but it really is nothing to write home about! Just taken delivery of the new 5mm BST Starguider EP. However, true to form it looks like another two weeks of cloud cover around here. Back yard session with a double and Panstarrs at last! For the first time in a while managed to get out yesterday for a bit of back yard observing. The forecast had been looking good for Saturday and given that there's no work Sunday it was game on! Knowing that this was a back yard session, I needed to break out the fold away obsy which comprises of a temporary greenhouse frame, 2 groundsheets, a green tarp and a dog blanket. Not the most aesthetic of contraptions, but keeps out the light from the neighbours kitchen and bedrooms. I set up the mount and left the scope outside to cool while the sun was setting before retiring in for a bit of a read up on targets. So, the order of the night was first light on the new BST Starguider 5mm EP. I used it to have a bit of a tour of the moon. I love these eyepieces. Everything was so clear with it when looking at the lunar surface. Especially where the light turns into shade. 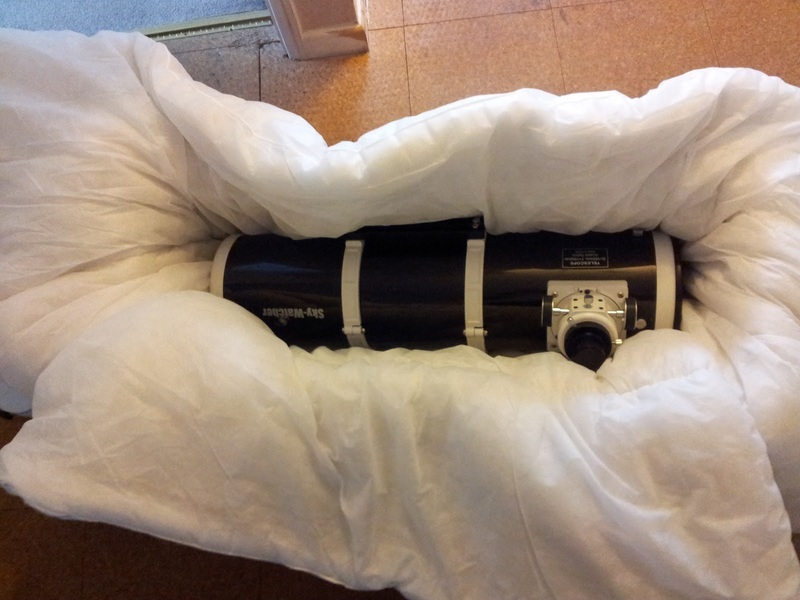 I have on loan a Skywatcher UHC filter from a friend in work. While the moon was too bright to see much in the way of nebulosity last night, it was still really interesting to see the difference it made. I'd never used a filter before and wanted to try before I buy, but think it'll be a worth while investment, especially when I get dark enough skies to go proper DSO hunting! In terms of things which I saw, well to be perfectly honest, I spent so much time faffing around with the filter in different EPs to experience the difference, I only saw two things of note. The first was a double star called Cor Caroli. I was really pleased with this, even though its a comparatively easy target I did manage to get good definition between the two stars, but not too much colour difference. Nevertheless a pleasing observation. And then, my last target was the one which I have been waiting patiently for, finally I managed to get Panstarrs. Not in it's best light I must admit, but I was determined to get it. In the end it did look quite washed out with the amount of light coming from the moon and saw not a lot more than a grey smudge. Using averted vision, I could make out a bit more detail in the 20 minutes or so I had my eye to the piece, but just being able to say that I saw it is important to me. So, a bit of a cobbled together observation report but there you go. After keeping a keen eye on the weather over the weekend, and the latest Sky at Night magazine being bought for me by SWMBO, I thought it would be a good chance to get out for a quick backyard session. So, I set up on the path running down the side of the house which give me a good SE/NW axis to look through. I had two objectives for the night. Firstly, to try out my new 5mm BST Starguider EP. Secondly, I wanted to see if Saturn rises high enough above the hill opposite the house for me to see. The new EP has already had one outing looking at the moon, but that didn’t last long. I come to conclusion that I need to invest in some filters after finding it quite uncomfortable looking at the bright moon for any period of time. Nevertheless, I was really pleased with the detail I could make out, and it gives me a future project of picking out and recognising different features on the moon. However, this time, I wanted to see what else I could see with it. I think it was about 9.45ish when I noticed a lone star coming up above the tree line. I checked with Stellarium which confirmed to me that there was a good chance that the apparent ‘star’ was actually Saturn. So, I swung my SW 150P around and lined it up using the 25mm EP. I had all but the briefest of glimpses before I got clouded out. I just about made out the slightly blurred and irregular shaped object, and then nothing. Looking up from the scope I could see cloud all around. My first glimpse must have been no more than 2 seconds max. Absolutely gutted! So close and yet so far. So, as I’d taken the time to set up, I could see Jupiter was still visible behind me so I swung around and started honing in on Jupiter and it’s moons. Swapping the EP for the new 5mm, I was pleased with what I could see. Now, to be honest, it’s a view which I have had before when I have barlowed the stock 10mm EP which came with the scope, but what I was able to appreciate this time around was the difference in the quality of the optics. The equatorial belts were really easy to pick out as were 4 moons. After 10 – 15 minutes or so, and a series of checks to see if the cloud had cleared which was blocking my view of Saturn, I decided that it would have to wait for another night, so I started packing away the EPs. Just at that point, I caught a teasing glimpse of a break in the cloud. I stopped what I was doing and just stared, straining to make out the planet. And then, with some interstellar magic, the cloud parted and I was back in business. I didn’t want to miss it for a second time, so grabbed the 12mm, slotted it into the focuser and off I went. Quickly got it in the EP, and then came the big smile and childish giggle as it came into view getting brighter as the cloud passed, and the ultimate confirmation of the rings coming into sharp focus. Now I thought would be a good time to see what else the 5mm could do. So, slotted it in, aware that this was about as much as my scope could cope with in terms of magnification. Every few seconds, I gave the RA knob a twist to keep the planet in the FOV, and started tweaking the focuser to get as sharp as image as I could. I was just so pleased with what I could see. I could make out 3 moons, but there was a yellow tinge to the image. The seeing wasn’t brilliant, and though I don’t really live in an area which suffers huge amounts from LP, the couple of lights that are around, and the high level thin cloud I think are the things which prevented me from seeing more detail. I tried to make out the Cassini division in the rings, but I couldn’t confirm them. I think I might have seen them, but at the same time my eyes could have been playing tricks on me. I’ll leave that one un ticked until next time! One nice moment was when my neighbour came home and I was able to show her what I was up to whilst lurking in the dark shadows between our houses. I was really pleased that I could demonstrate that not all the twinkling lights in the skies are stars! So there you go, plenty enough to make me want to see more, and by looking at the forecast, I should get a good chance a couple of times in the coming nights. Well, it's been quite a while since this blog was added to. In truth, not much has been observed due to the lighter Summer nights other than a bit of Lunar Observing for the Moore Moon Marathon. But, now with the nights beginning to get darker and with the good weather we have been having, it was time to turn the attentions to carrying on with the observing. We've just returned from a weeks camping on the Roseland Peninsular, and what turned out to be a fantastic dark sky site, Tretham Mill touring site provides electric to all their pitches and has an area for dogs too. OK, it's not pitch black all around, but most people were tucked up in bed by 11.00 so there was little in the way of light to worry about. However, with the dog walk area just a few tens of meters away, it was never going to be hard to find somewhere out of the way to set up. The weather during the days was excellent and gave us 3 or 4 of good night skies for viewing. The moon was getting later in the night so we were able to get both lunar and DSO viewing in. During the sessions, I managed to add to my Messier tick list with ticks of M27, M29, M57, M92 and M13 along with some select double stars in Cygnus and Lyra. For more info, please see the observations table. Thanks to the weather, it was also the first time the Autumn that the milky way was visible through Cassiopeia and Cygnus stretching over to the horizon. 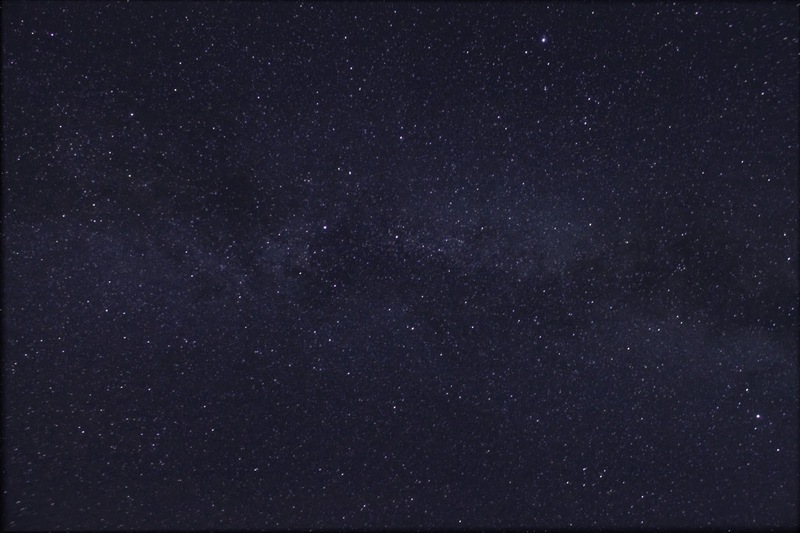 The Milky Way through Cygnus with Lyra to the top and Delphinus to the bottom. Upper portion of Ursa Major - The Plough. Visiting friend in the Ardeche - 8th - 17th November 2013. After quite a busy Autumn period crossed with some rubbish seeing conditions, we took the chance to head out to France and stay with our friends in the Ardeche. Knowing that they had the potential for some superb dark skies, the scope came for its first international trip. As expected, the views from the area were uninterrupted and had very little in the way of light pollution to get in the way. There was however, one slight issue. The duration of our stay covered the period on the run up to the full moon. This was unfortunate when it came to DSO observing but it did give some exceptionally clear views of the lunar surface. There were a total of 3 observable nights which I took advantage of. The first of these nights, I had the company of Sam. A young lad who had never used a telescope before but took to it really well. After setting up the scope and going through the collimation process during the last dregs of daylight, we set the scope up in our viewing position and left it to cool. So, we started looking for targets and by getting Sam to learn a few of the constellations, and the Telrad, we soon homed in onto the Ring Nebula. I thought Sam did very well to pick this out given the bright rising moon. Also observed were the Pleiades and Hyades and a number of shooting stars. unfortunately, because of increasing brightness of the moon, it meant that each evening, we were able to observe less and less, other than the moon. We were also able to view Venus in the twilight hours each evening. Venus in the twilight skies. An impromptu photo chance when taking the dog for a walk. This is the first time I've had chance to do any sort of observing since taking the photos above. The weather has been mainly crap and at best very unpredictable. Forecast says cloudy/rain - go to let the dog out before going to bed only to find that stars out and not a cloud in sight. Anyhow, during this Christmas break, I've been determined to get out and do some gazing and tonight proved to be the best chance in recent weeks to get out. So, just at dusk, I set up the tripod outside and waited for darkness to fall. Half hour later, I took the scope out and put it on the mount. It had been so long since I had been out last that I didn't wait for the scope to cool at all and turned my attention straight to Jupiter. Using Jupiter to line up the Telrad, I had my first look at this favourite since early last spring. It was good to see it again. And so started a rampant tick fest of observations. Some new ticks, some more familiar visits to favourites. The observation table shows the total tally for observed objects for the evening, but the notable ones for me were M1 (though seen before, still a good object to find. NGC 7635 - The Bubble Nebula (new tick). NGC 457 - The Owl Cluster. This was a bit confusing at first. I knew I have previously observed The Owl Nebula, and at first I thought I was going nuts because I didn't recognise the object, but then realised that tonight I was looking at a different object, The Owl Cluster. To me this seemed more impressive and it was very clear. To add to confusion, Stellarium was labelling the same feature as the Dragonfly Cluster. A quick check online told me that it was in fact the same object. And finally, the observation I was most proud of this evening - M31 & M32 Andromeda. I had never observed this galaxy before. I've read all sorts about it. How it's most amateurs first object to look at, how it's massive and bright, how it can be a naked eye object under correct conditions But for some reason I have never been able to track it down. After a break for some dinner, I went out with the Telrad chart to help me find it, determined that I was going to track it down. And then, I did! My first reaction says it all really - How the flip have I missed that? So, with that ticked, and a quick visit to the Orion Nebula, it was time to come in. Frost forming on the scope and dew misting up the Telrad despite a valiant effort from the home made dew shield, I packed up and come in for some warmth.